For me the ESP8266 Arduino Core was exactly what I was looking for. Especially, because I was already familiar with Arduino development. Unfortunately, the Webduino-Smart does not feature a USB-TTL adapter. As a consequence, the Webduino Smart cannot be programmed/flashed as easily as I was used to from the Arduino UNO. After doing some research I was able to misuse the Arduino UNO board as an USB-TTL adapter. So here is how I could upload my sketch from the Arduino IDE through the Arduino UNO to my Webduino-Smart. 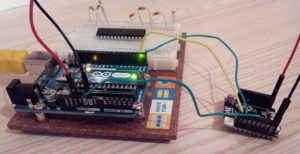 Remove the ATMEGA microcontroller from the Arduino UNO. The Arduino is still accessible through the device /dev/ttyACM0. Connect the grounds of the two boards (GND <-> GND). Pull the GPIO0 of the Webduino to 0 by connecting it to the ground of the Arduino (GND <-> 00). This puts the ESP-12/ESP8266 into flash mode and lets you flash a new firmware to the device. Power the Webduino with 3.3V by connecting the 3.3V ouput from the Arduino to the power input VCC of the Webduino (3.3V <-> VCC). Select the ttyACM0 connection in the Arduino IDE (Menu Tools -> Port). Choose “Generic ESP8266 Module” as your board in the Arduino IDE (Menu Tools -> Board). This option is only available if you installed the ESP8266 Arduino Core. Upload the sketch by pressing the upload button in the Arduino IDE.Note: I had to disconnect and reconnect the power of the Webduino before uploading a sketch. In order to run the sketch I simply removed the (GND <-> 00) connection so that the Webduino boots no longer into flash mode. Then reboot the Webduino by disconnecting and reconnecting the power supply. I read somewhere that it is not necessary to remove the ATMEGA microcontroller. The entire process should also work with the controller in place. I never tried this since I was fine flashing to Webduino without the controller. Disclaimer: I know that the Webduino runs on 3.3V but the TX/RX pin of the Arduino are 5V. So, there is a risk of frying the Webduino. It worked for me without problems though. So, just for the record, use this procedure at your own risk!